"Großes Gesichtsfeld" at Haus am Lützowplatz is Heiner Franzen's first institutional exhibition in Berlin. This is not only reason to celebrate. It is long overdue. And it is outstanding. 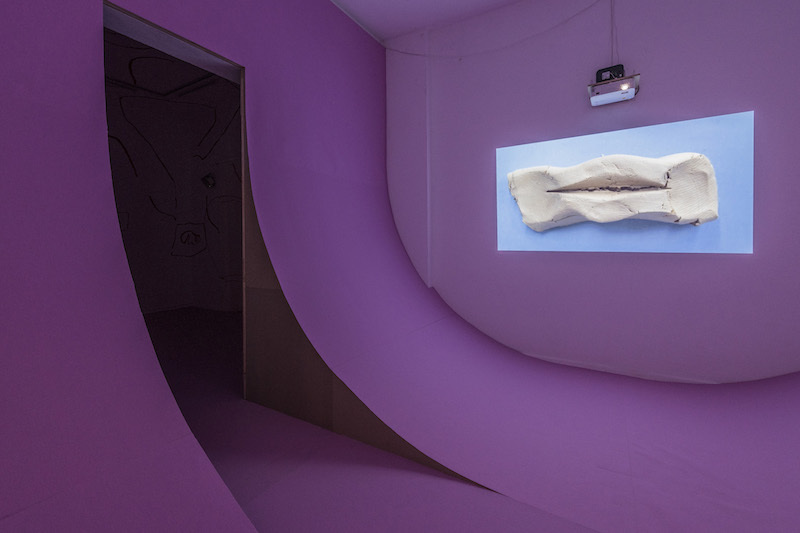 Franzen, a multi-disciplinary artist who is based in Berlin and has been a visiting professor in art academies in Braunschweig and Berlin Weißensee, expresses a quiet, but an explicit voice and vision with his work. Despite his expertise, he curiously explores image culture and the way he perceives these images. With his current exhibition, thus, he attempts no less than to trace how imagination exists in our minds. Heiner Franzen: ...Yes, that's the focus. 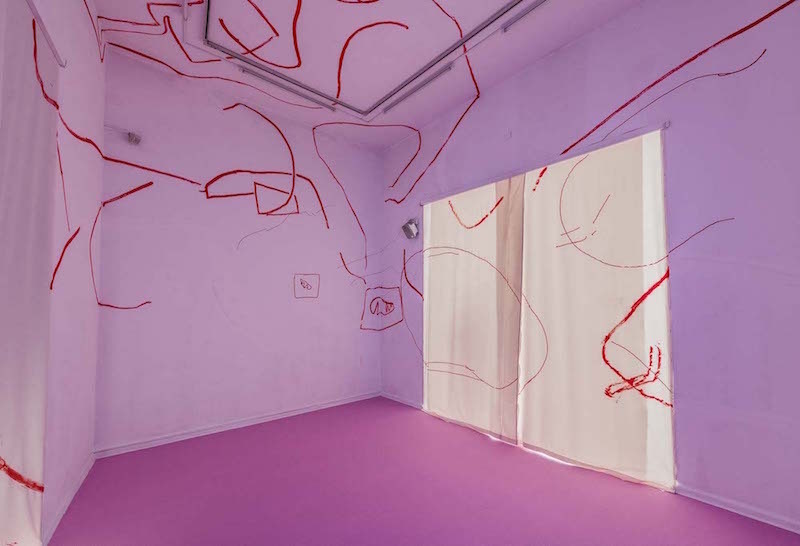 Although there are spatial drawings – especially in the intermission room. These are all left overs from performances I did. For example from the performance "Kartenraum," which was dedicated to Heinrich von Kleist's essay "On the Gradual Production of Thoughts Whilst Speaking." The performance took place at the train station of Berlin Wannsee, close to where Kleist and his girlfriend Henriette Vogel committed suicide two centuries ago. I stood inside a box doing drawings – the people around me could only see the gradual production of the drawing, but I remained invisible to them. What you see in the exhibition are figurative splinters and fragments; I call them "characters." At the train station, the actual drawing was the spectators’ movement around the box. The line is a time-line – it leads to something. This is how I think about drawing or even my practice in general: I don't hinder hesitations and changes of plans – I follow them and make them a part of the work. I don't question why I choose certain images. ALW: The projected images include stills that you rendered into moving images, film snippets and animations. Where do they come from? HF: They are from my own collection. Whenever I see something that causes some kind of distraction or disturbance – this could be a sequence in a film, a drawing, a photo or something else –– I tend to store this material and often reactivate it after a while, by starting with few images and turning them frame by frame into animations. ALW: What connects these snippets? HF: I imagine them to be sitting together at a table. They would work singularly, but they also all belong together in some sense. 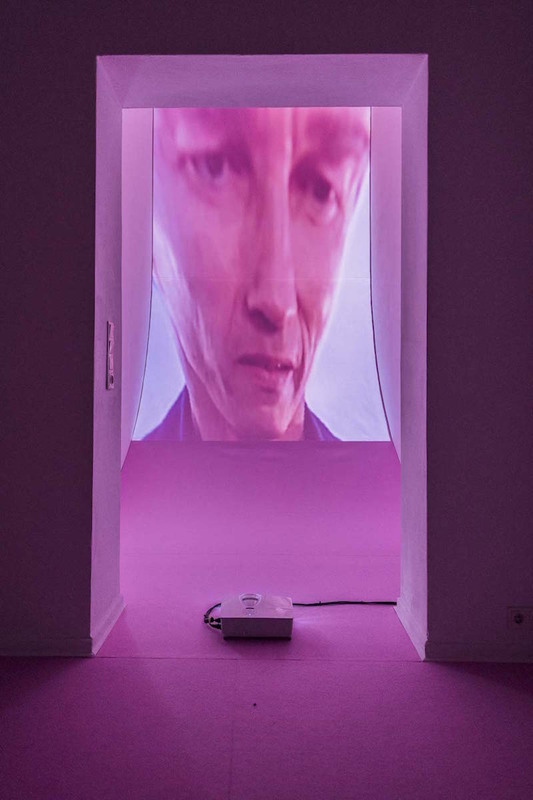 ALW: The exhibition is called "Großes Gesichtsfeld," which translates to the large field of vision. 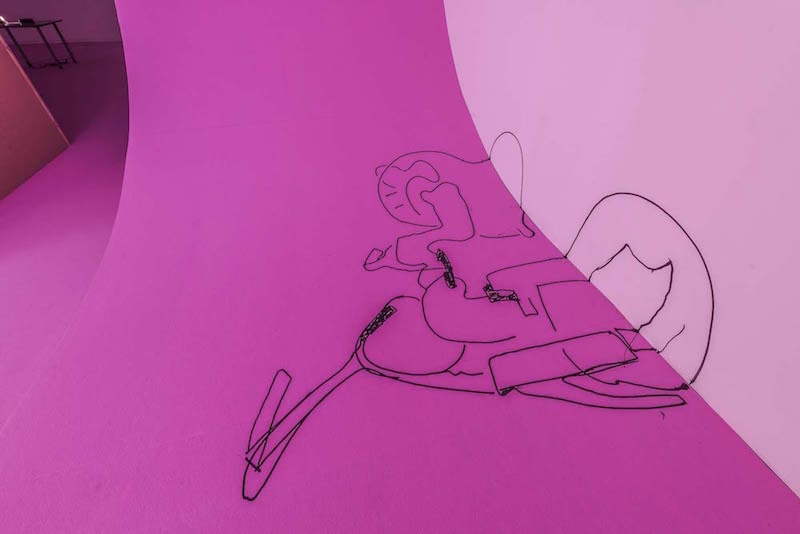 When wandering through the pink architecture and encountering these images in the space's convolutions, I rather felt like walking through an expanded field of your mental space. HF: "Gesichtsfeld," for me, is the backspace of my sight. I’m interested in the way inner images occur or move, for example while reading. I have this idea of a dimmed spotlight panning through my head. ALW: You visualise inner images that are kept inside our brains? HF: Exactly. That's my service. ALW: That's nice of you, thanks! 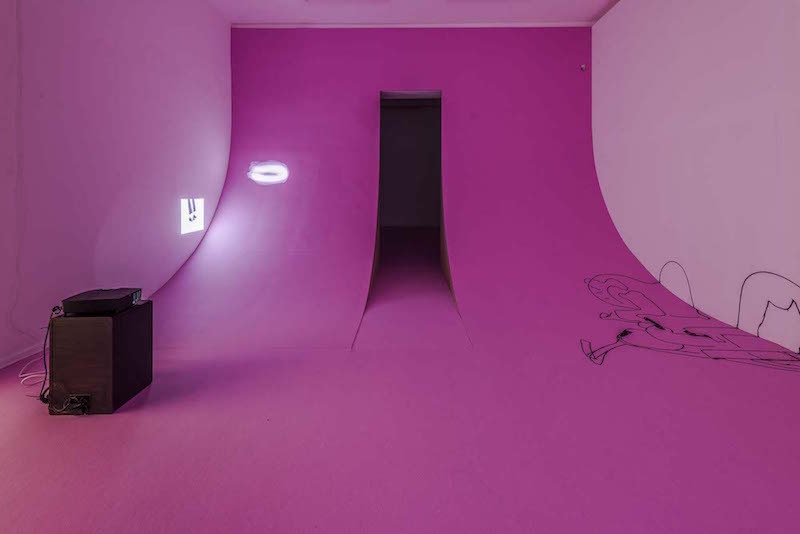 Although the exhibition contains your personal "snippets," I think the pink architecture within the exhibition space's architecture emphasises such surreal circumstances that spectators get immersed. HF: You are inside an organ. It's a surgery, in a sense. I am interested in the relation between human being and machine, in the externalisation of an organ. ALW: Is that why you chose the colour pink for this externalisation of your thoughts? HF: At first I didn't want this colour at all. I wanted a skin coloured latex fabric. But that wouldn't have worked for the overall architecture. During my research I kept on returning to pink as the most neutral colour I could find. We found this pink carpet, which we ended up using everywhere in the interior of space, covering all spatial constructions. I normally don't like carpeted floors, but this one turns the entire exhibition into one work. The visitors don't stand in front, but inside the work. By having an abolishment of wall and floor space, I get spectators closer to the projections; they are literally inside of them. The pink covers that people are supposed to wear over their shoes make them part of the work. ALW: The floor and wall space of last room in the exhibition is half circular. 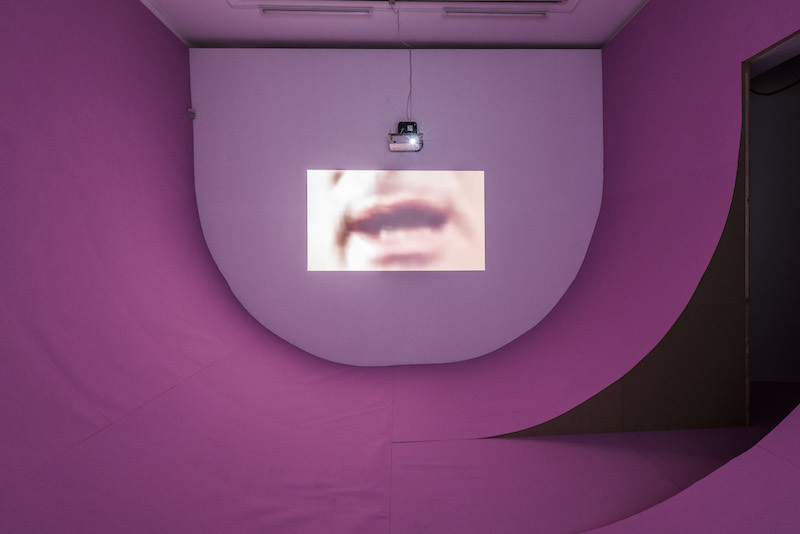 Two projections that face each other, each show a moving image: an animated, moving mouth made of modelling clay on the left and a film snippet of a speaking man on the right. What is it that we see here? HF: The work is called "Salo Haus," referring to the Pasolini movie "Salò, or the 120 Days of Sodom". “Salo Haus” implies a series of works that deal with the act of speaking and staging of lips, tongue, breath and vocal chords, using here the act of a despotic agitation: Patrick Magee playing Marquis de Sade in the screen adaptation of Peter Weiss’ “Marat/Sade”, directed by Peter Brook. The material is a three-minute monologue. De Sade talks to us about the pleasure of killing, which – opposite to the indifferent killing by nature – defines man. The scene is not so much about what he says. It’s about how Magee/Sade uses his mouth as a stage. ALW: The manipulative efficiency of image and media? ALW: When was the last time something got stuck in your mind and caused your interest? HF: There was a fragment in the series "Fargo" – details of hands, of gestures. There was a moment that seemed odd, as if there had been a continuity mistake. I have made a few drawings about these sequences. ALW: You know a lot about the film genre. Have you worked in the film business? HF: Not really. I made some experiences as an amateur actor, for example in some films of my friend John Bock. ALW: Is it through the storyboard of films that your two main practices – drawing and video – come together? HF: ... It's always me. Not only because I made these works. It always reflects the subjectivity of my perception. ALW: But the snippets also act as quotes, don't they? 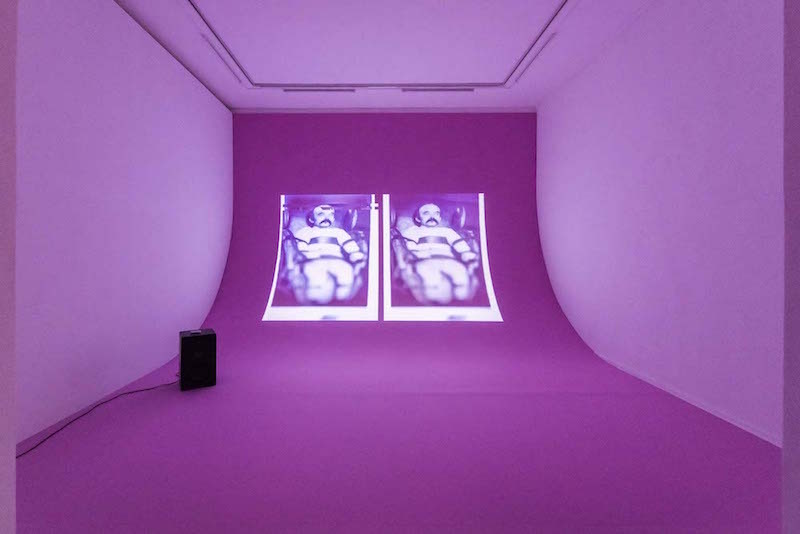 For example in the projection at the start of the exhibition, where you see this disturbing image of man tied to a chair. HF: It's a singular image that I edited. This type of chair was used in psychiatric treatment during a long period in the last century. During my civilian service I worked in psychiatric institutions with patients that I regularly had to fixate. It certainly left a strong impression on me, especially because I am very claustrophobic myself. But this animation is rather about the constant change of my point of view while I work on somebody or something. ALW: The projection work "Smile" is installed in a small space inside the show. We see a man with an awkward facial proportion, trying to smile. Who is this? HF: This is a manipulated image of Arnold Schwarzenegger from the movie "Terminator 2" (1991) – he plays a cyborg observing a smiling couple, measuring the smile and then starting to practise it. His uncertain facial expression resembles the first exercise on a new instrument. I’m interested in every first attempt of a machine trying to simulate us – and vice versa.